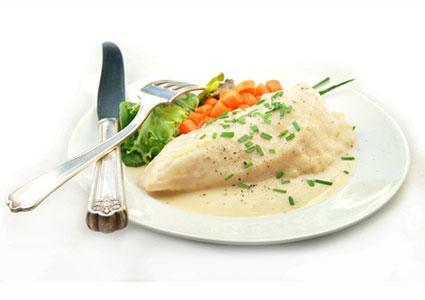 Cooking chicken with a white wine sauce creates a beautiful flavor combination. Wine brings out the flavors in the chicken and herbs, making a satisfying and delicious main dish. When cooking chicken with white wine, choose a dry white such as Chardonnay or Sauvignon Blanc. Beurre blanc sauce is a creamy, velvety and flavorful sauce made with white wine, vinegar, shallots, and very cold butter. While a traditional beurre blanc doesn't incorporate cream, this one does to keep the sauce from breaking and give it a slightly creamier texture. Add chicken breasts and cook until done, about six minutes per side. Remove breasts from pan and set aside, tented with foil. Add vinegar and wine to pan, using the spoon to scrape any browned bits of chicken from the bottom of the pan. Bring pan contents to a simmer and continue cooking until the contents of the pan have reduced to about one to two tablespoons of liquid, about three to four minutes. Stir in cream, whisking to combine. Simmer for two minutes, until cream reduces slightly. Starting with a single piece of butter, whisk butter into pan, whisking constantly to keep sauce from breaking. Continue whisking one to two pieces of butter into the pan at a time until all the butter has been incorporated. Remove pan from heat and whisk in pepper and tarragon. Serve chicken immediately, topped with sauce. Braising chicken in wine yields a very tender result with a flavorful sauce. Serve alongside cooked egg noodles with the sauce spooned over the top. Season chicken pieces with salt and black pepper. Heat two tablespoons oil in a large dutch oven over medium-high heat. Working in batches so you don't overcrowd the pan, add chicken to the oil and cook until it is well browned on all sides, about four minutes per side. The chicken will not be cooked all the way through. Remove the chicken from the pan and set aside on a platter. Add pancetta and cook until it crisps and renders fat, about three to four minutes. Remove pancetta from the pan with a slotted spoon and set aside on the platter with the chicken. Add celery, carrot, and onion to the pan and cook until it is softened and begins to brown, about four to five minutes. Add flour and cook, stirring constantly, until flour loses its raw scent, about 2 minutes. Stir in white wine, thyme, and chicken broth, using the side of the spoon to scrape all browned bits off the bottom of the pan. Bring to a simmer. Return chicken pieces and pancetta to the pan, stirring to distribute evenly. Bring to a simmer, cover, and reduce the heat to medium. Cook until chicken pieces are cooked through, about 45 minutes to an hour. Uncover pot. Remove chicken and set aside on a clean platter, tented with foil. Skim any excess fat from the top of the sauce. Simmer sauce uncovered over medium heat until it begins to thicken slightly. Taste sauce and adjust seasonings by adding additional salt and pepper, if necessary. Serve chicken on egg noodles, topped with sauce. White wine works well in chicken dishes like those outlined above because it adds flavor to the chicken. The best part is you have leftover wine to serve with dinner, or you can pour yourself a glass while you cook. Enjoy!